By the time the Second World War ended in 1945 the 28th (Maori) Battalion had become one of the most celebrated and decorated units in the New Zealand forces. The pinnacle of its achievement was the Victoria Cross won by Te Moananui-a-Kiwa Ngarimu in 1943. 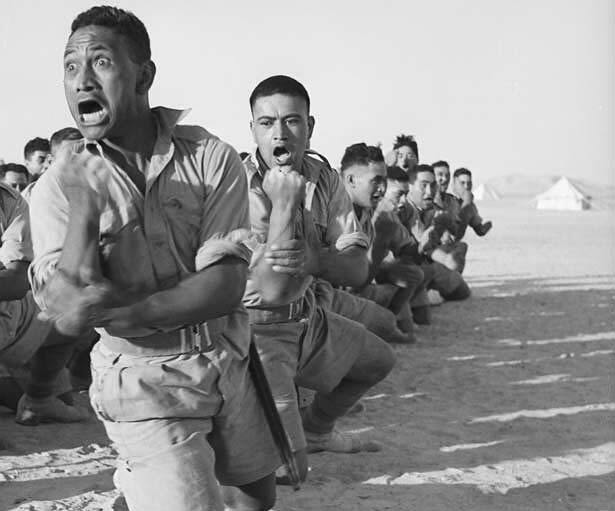 Ultimately, nearly 16,000 Maori enlisted for service during the Second World War. New Zealanders reacted with patriotic fervour to the outbreak of war in South Africa in 1899 and again when the First World War began in 1914. Imperial policy had officially excluded Maori from fighting in South Africa, but a number still enlisted. That policy was still in place in 1914, but a change of heart in London saw several thousand Maori eventually fight in the First World War. Some Maori leaders, such as Apirana Ngata, saw participation in war as the ‘price of citizenship’. Others, such as the Kingitanga leader Te Puea Herangi, questioned why Maori should fight for an Empire that had, within living memory, invaded and occupied their lands. Their request could not be denied them by their elders and chieftains, all their long history had been steeped in the religion of war, and the training of the Maori child from his infancy to manhood was aimed at the perfection of the warrior-class, while to die in the pursuit of the War God Tumatauenga was a sacred duty and a manly death. While leaders such as Apirana Ngata stressed the 'price of citizenship' line, ultimately many Maori enlisted for a mixture of reasons – to escape poverty or life in the backblocks or to follow their mates. We have 14 biographies, 20 articles, related to Māori and the Second World War.